Public Works (PWs) programmes are implemented by the government or aid-agencies to create short term employment for increased income and food consumption, poverty and poverty gap reduction, and infrastructure development. PWs are a prominent part of the social safety net portfolio in developing countries, especially in Africa and South Asia. The modern version of PWs was initiated by the US government in the 1930s in response to the great depression and by Germany in the 1940s for reconstruction after the second world war. However, public works programmes have a much longer history. A section of road between Islamabad and Peshawar in present-day Pakistan was constructed in a 12th century public works relief programme. England’s 18th century Poor Employment Act was used to hire surplus labour to build canals and roads and to drain marshes, thereby laying the foundations for the industrial revolution. In 1975, the World Food Programme (WFP) introduced workfare programmes in Bangladesh to create employment opportunities for the rural poor population during lean seasons and maintain / develop public assets: earth work, re-excavation of canals and ponds, repair of embankments, and other community assets. Most of the early workfare programmes were male dominated. However, the Rural Maintenance Program (RMP) of CARE, operated for about 25 years, employed only poor rural women on public works. CARE also trained women beneficiaries on awareness raising and techniques of undertaking income generating activities to develop sustainable livelihoods. Strengthening Women’s Ability for Productive New Opportunities (SWAPNO) is a third generation social transfer project for ultra-poor and vulnerable women headed households in the 18-50 years’ age group. The project is being implemented in two districts by the Local Government Division with UNDP’s technical assistance. SWAPNO aims at permanently lifting women beneficiaries out of poverty, through 18th months’ employment by the Union Council, along with life-skills and market oriented vocational training. The overall objective of SWAPNO is, “Economic growth is achieved in a more inclusive manner, with economic opportunities reaching rural poor women and vulnerable groups are protected against shocks”. SWAPNO has created public works employment for 4464 women in Kurigam and Satkhira districts which are prone to climate change related vulnerabilities. Kurigram is located in the north and shares boundaries with Assam and West Bengal states of India. The district is known for abject poverty, seasonal drought, recurrent flash floods in the monsoon, and river erosion. Satkhira is a southern coastal district and vulnerable to climate change, in the form of salinity intrusion, tidal surge, and cyclones. One third of the population of the district are yet to recover from the devastation caused by cyclones Sidr and Aila. Moreover, due to silted up rivers, badly planned or executed infrastructure projects which block drainage and water infrastructure not being properly maintained, waterlogging has become a recurrent cause of destruction of livelihoods and road communication in the monsoon. SWAPNO has addressed a common criticism of PWs that the assets built in workfare schemes are often of low quality and of little use, by engaging local communities in selection of schemes of maximum utility along with refinement with a pro-poor lens and related to recognized community needs for disaster risk reduction and localized adaptation to climate change. SWAPNO women beneficiaries have repaired and maintained 5977 PW schemes. These schemes were identified by community members along with the Union Council representatives at grassroots (ward) level meetings. 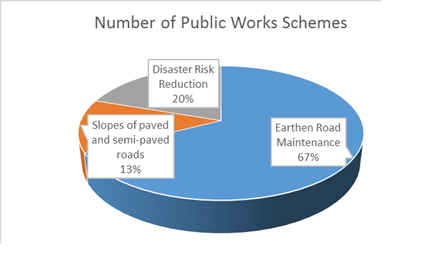 These schemes are broadly categorized in three groups: Earthen road maintenance – 4032 (67%), disaster risk reduction – 1181 (20%) and earth filling on the slopes of paved and semi-paved roads – 764 (13%). The disaster risk reduction related schemes include embankment repair, canal re-excavation, and field raising to protect from flooding and water logging. Also some of the road work has been disaster related. The SWAPNO women played a prominent role in repairing roads damaged by severe flooding in Kurigram district during the 2016 monsoon and thus helped to quickly restore road communication and normalcy after the flood. Rural roads are an important means of connectivity and access to information, opportunities, and services for rural communities in Bangladesh. Robert Chambers has pointed out five core dimensions of poverty: lack of income and assets, disability, vulnerability to emergencies and disasters, powerlessness, and isolation or lack of accessibility. SWAPNO women beneficiaries contribute to ensure year-round connectivity in 124 unions. Although Bangladesh has a road density of 1.84 km/km2 compared to an average of 0.84 km/km2 for South Asia, a World Bank assessment of rural infrastructure found that districts with longer and denser networks had a lower percentage of good roads due to inadequate maintenance. Rural earthen roads and slopes of paved or semi paved roads are often subject to erosion in the monsoon, while drainage gaps (insufficient or missing drainage structures) have rendered a large part of the feeder and rural road system unusable during the monsoons. Accessibility, whether it is to markets, schools, health clinics, water points, places of worship, and community centres in rural areas or to the nearest town or city, is a precondition for the satisfaction of almost any economic or social need. Accessibility refers to the ability to make use of opportunities embodied in goods, services, activities, and destinations. For rural dwellers, access both defines and creates the opportunity to improve their social and economic well-being. According to Todd Litman, access is the ultimate goal of most transportation activities; even recreational travel has a destination, such as a restaurant, a resort, a campsite, or a beach at the end of a trip. Rural roads are a key component of rural development. Once adequately developed and maintained, rural roads enable and foster rural connectivity vital for improving rural incomes (on and off farm), creating productive jobs, and promoting access to economic and social services. Critically, the SWAPNO public works aim not only at maintaining and developing public assets essential for the economic and social life of poor local communities. They also aim to protect participants and their households from poverty and vulnerability, develop skills for more productive engagement by stressing future employability, and provide a broader set of inputs required for deeper developmental impact, including support for appropriate livelihoods development. Cyclone Sidr struck the south-west coast of Bangladesh on 15 November 2007, with winds up to 240 kilometers per hour. The category 4 storm accompanied by tidal waves up to five meters high and surges up to 6 meters in some areas, breached coastal and river embankments, flooded low-lying areas and caused extensive physical destruction. Cyclone Aila devastated 10 coastal districts on 25 May 2009, with Satkhira and Khulna districts worst hit.